I teamed up with the California Walnuts to bring you this Walnut-Crusted Chicken. I’ve been compensated for my time. All opinions are mine alone. Walnut-Crusted Chicken is an easy dinner idea you can use for chicken tenders or chicken breast. I like to pair the tenders with a colorful salad for a new lunch idea, or add your favorite dipping sauces and watch the kids dig in! 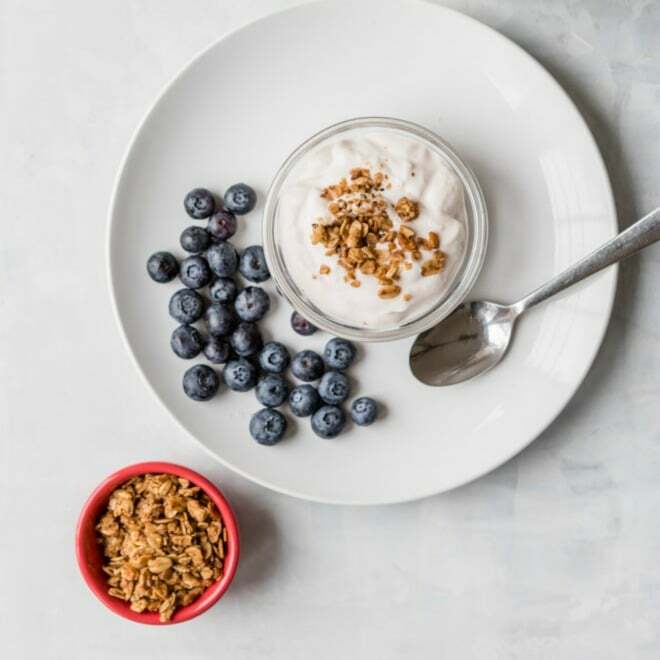 As soon as the holidays are over, I push the reset button on my meals and start thinking about leafy greens, giant salads, and clean eating to start the year off right. 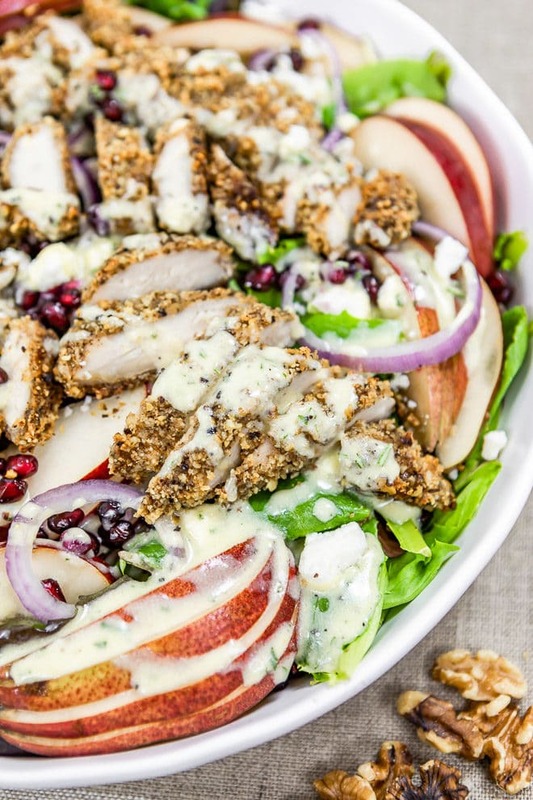 This hearty winter salad topped with walnut encrusted chicken is beautiful and healthy, anything but a sacrifice. Besides that, it’s quick to pull together, even on a weeknight. Ground California walnuts are the star of the show, making the baked chicken crunchy and so delicious. 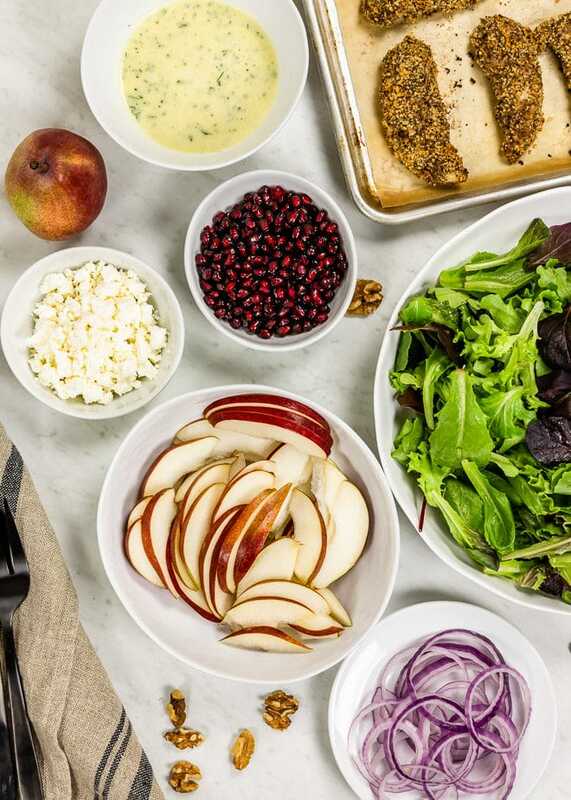 While the chicken bakes, all you have to do is gather up the salad ingredients. Nothing is better than dark leafy greens, sliced red onion, ruby colored pomegranate seeds, juicy pears, and sharp, salty feta. You can serve it up on separate plates, or one big gorgeous platter for dinner with friends. 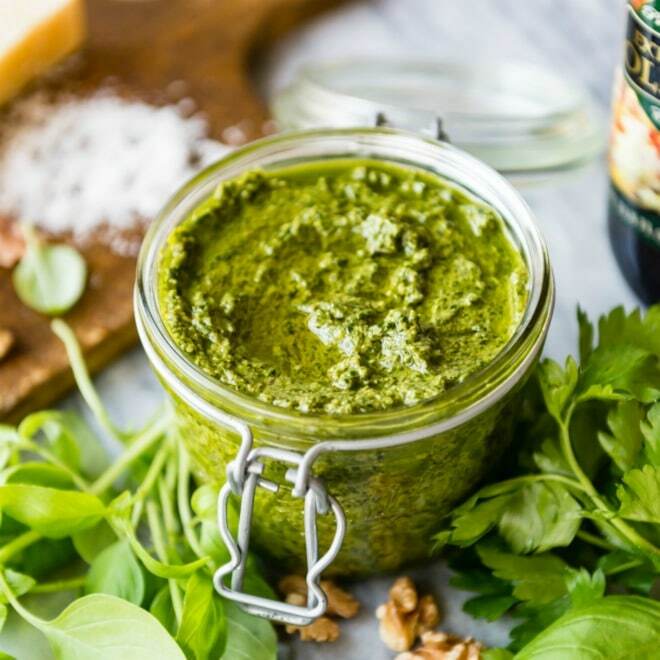 When you’re ready to feast, everything gets drizzled in a creamy, herby, honey mustard dressing you make yourself. What is the best way to grind walnuts? A small or medium food processor is excellent for chopping nuts finely. Put nuts in the bowl of a food processor. The key here is to pulse for a few seconds at a time until nuts are fine and evenly ground. Be careful not to process nuts for too long or they will become oily or turn into nut butter. I don’t recommend using a coffee grinder to chop nuts; the bowl of a coffee grinder is very small. Unless you have a dedicated grinder for spices and nuts, it’s difficult to clean and may be more trouble than it’s worth. 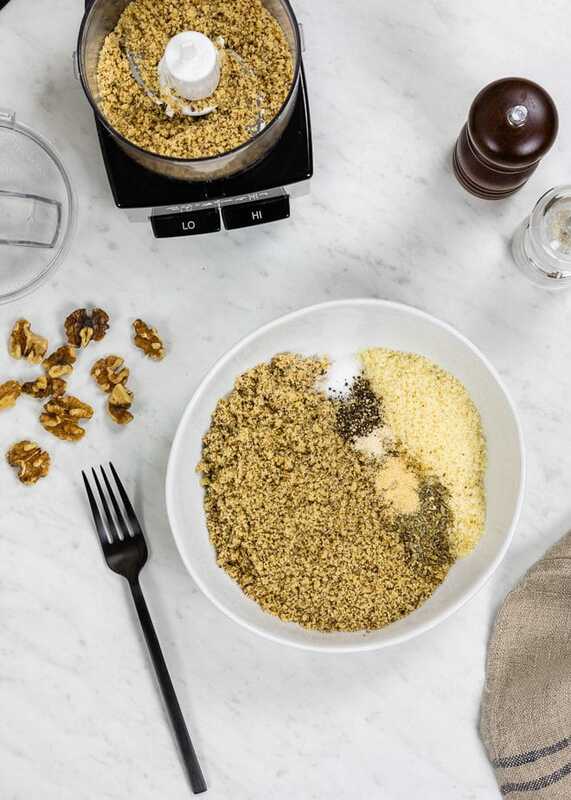 As far as grinding nuts without a food processor, if you’re really good with a knife and have some extra time, you can certainly finely chop the walnuts by hand. 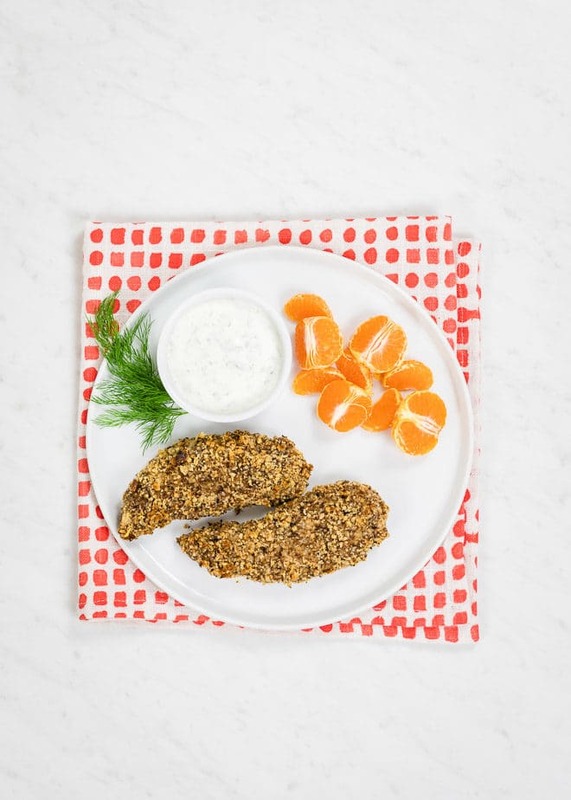 How do you make healthy Baked Chicken Tenders? Baking the chicken tenders is so much healthier than frying. Instead of breading, I grind up heart-healthy1, omega-3 rich California walnuts (2.5g/oz of omega-3 ALA) to coat the chicken tenders. 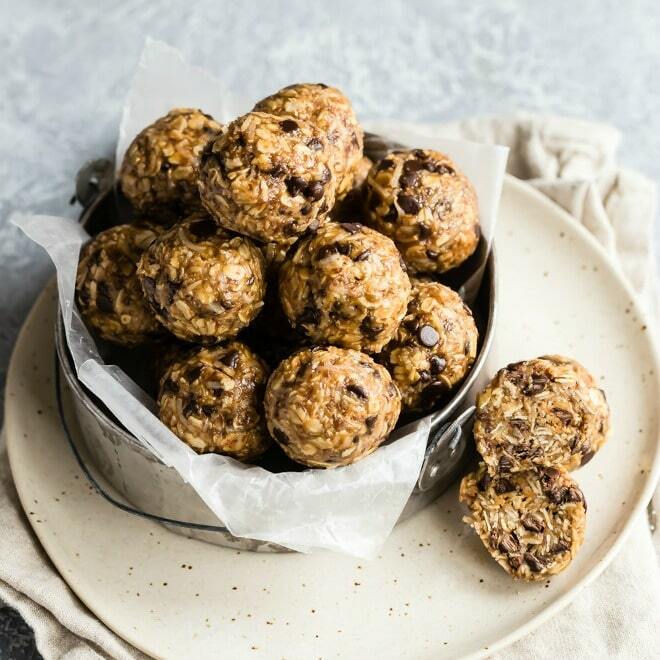 Nuts are full of nutrients, protein, and healthy fats, plus they taste amazing! 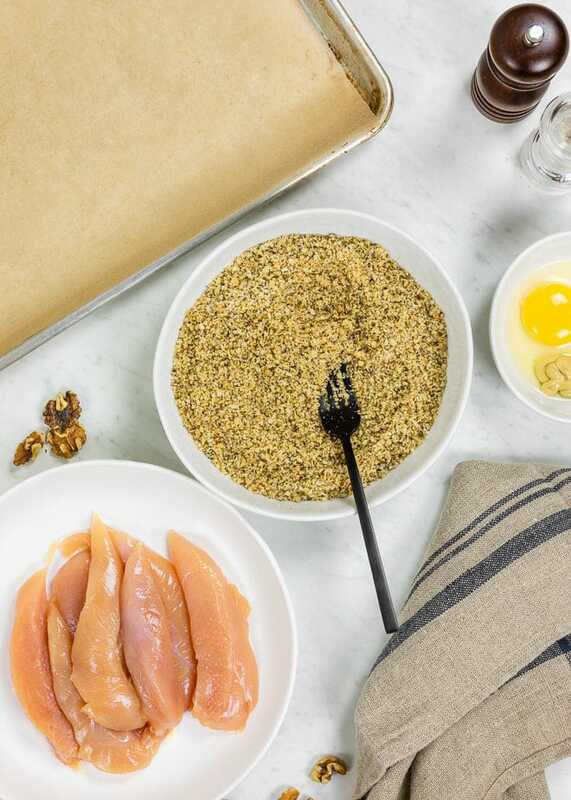 How do you make Walnut Crusted Chicken? First, combine the ground walnuts, cheese, herbs and spices in a shallow bowl. Then, beat the egg and mustard together in a second shallow bowl. One at a time, dip the tenders into the egg mixture, and then into the walnut mixture. Use your fingers, a fork, or tongs. Gently pat the coating onto the chicken. 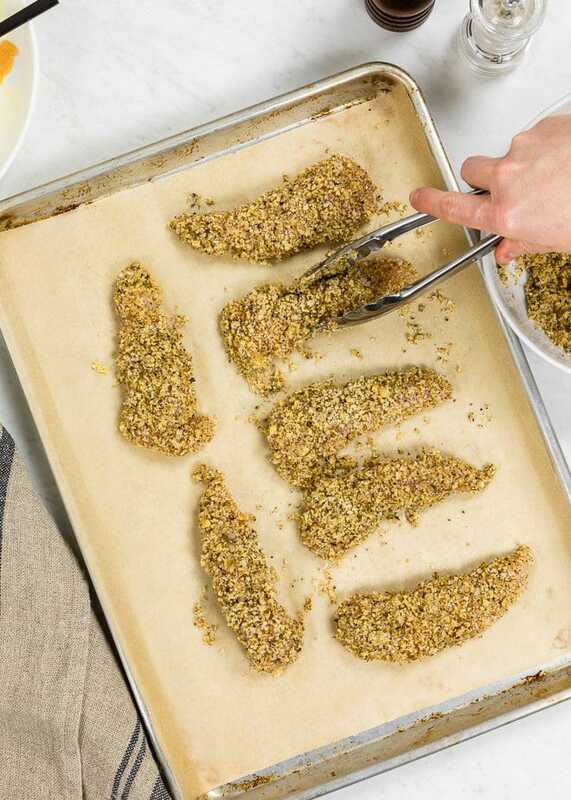 Place the tenders on a baking sheet. Bake at 400 degrees until the internal temperature of the tenders reaches 165 degrees. How long do you cook Chicken Tenders in the oven? 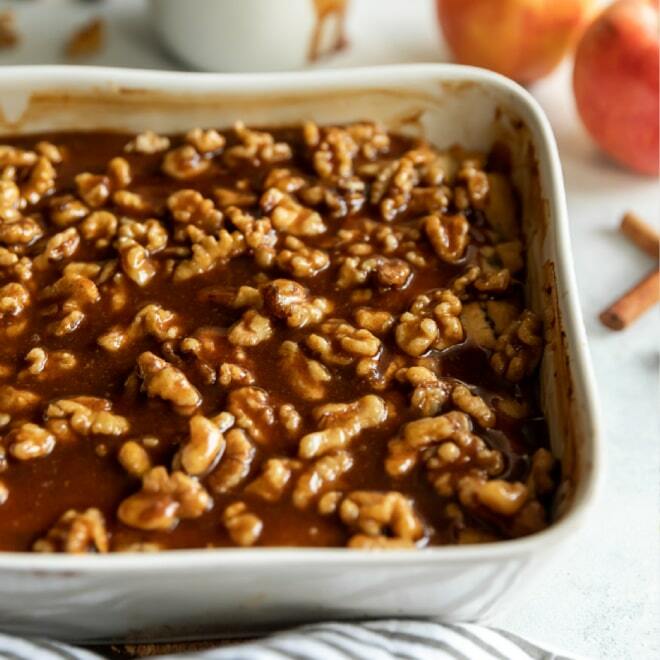 In order to toast the walnut crust, I recommend a slightly higher cooking temperature in this recipe than one you may be used to. Because oven temperatures (and the size of the chicken tenders) can vary from kitchen to kitchen, it’s best to use a meat thermometer to gauge whether the chicken is fully cooked. Poultry is safe to eat when its internal temperature is 165 degrees. For this recipe, I chose tenders on the larger side, and baked them at 400 degrees for a little more than 20 minutes. By the time they were ready, the walnuts were toasted and golden. If you’re roasting other things in your oven at the same time, you might need to use a different cooking temperature. It seems like restaurant menus everywhere feature some sort of breaded chicken tenders on a salad. Most likely they’re deep fried and thrown onto the lettuce only as an afterthought. I guarantee you: none will taste as good as these. Besides, I’m a firm believer in cooking meals at home. When you make your own food using quality ingredients you’re in charge of, you’re eating healthier, no matter what. Keep the oven hot. Make sure you preheat your oven and don’t allow things to cool by opening the oven door too many times. Flip and turn your chicken pieces halfway through cooking so they make contact with the baking sheet. 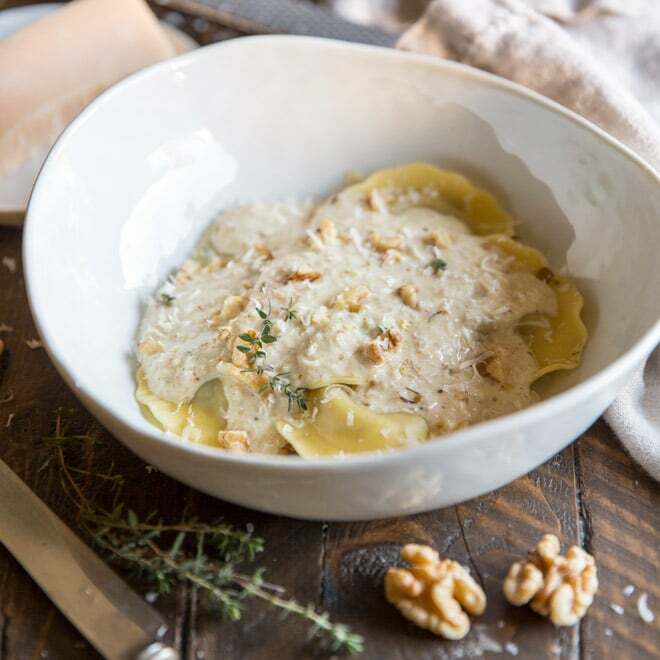 Be sure not to over grind your walnuts, or you’ll get paste instead of dry, finely ground walnuts. 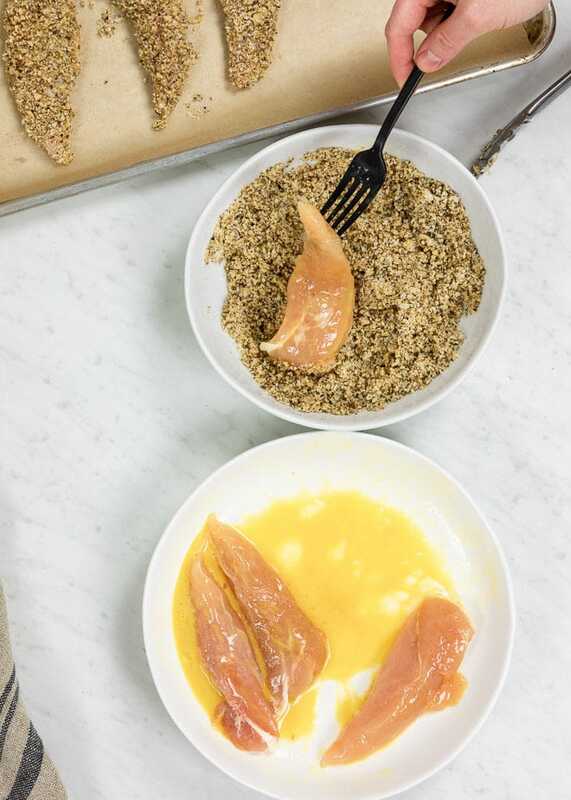 Cut chicken breasts into 4-6 equal strips, depending on the size of the breast, and proceed with the recipe below. 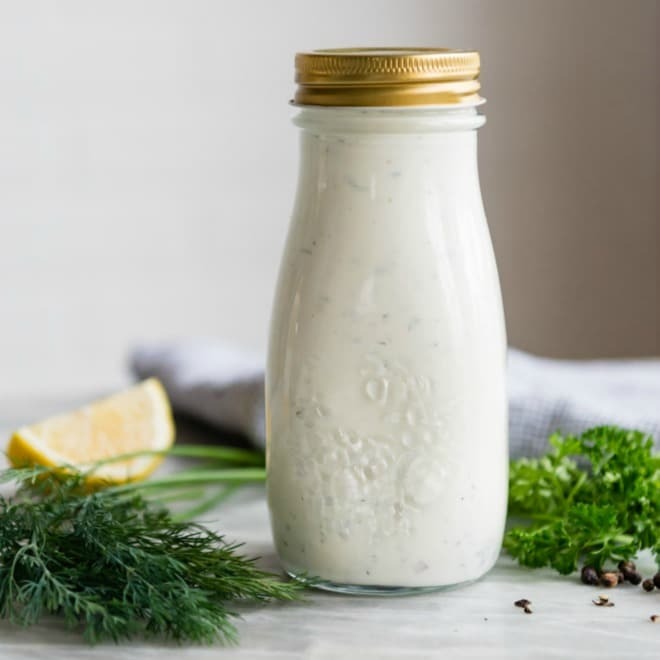 For a kid-friendly option, try serving with my favorite homemade Buttermilk Ranch Dressing. 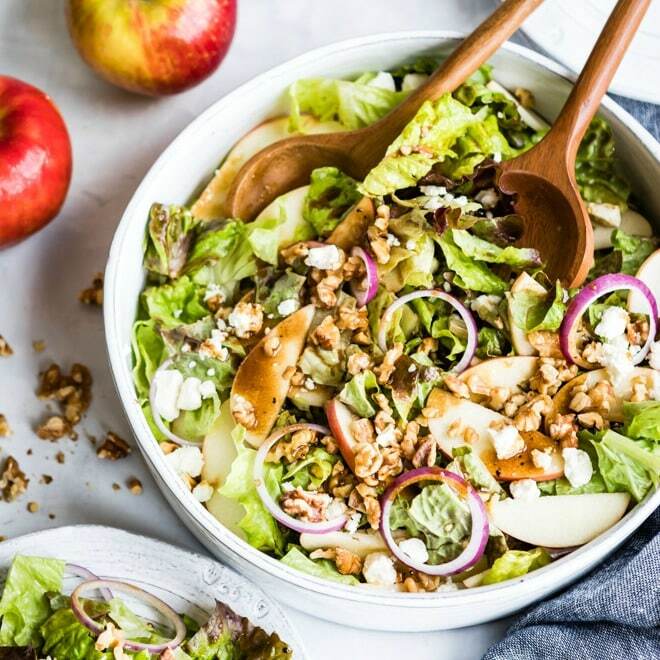 1 Supportive but not conclusive research shows that eating 1.5 ounces per day of walnuts, as part of a low saturated fat and low cholesterol diet and not resulting in increased caloric intake, may reduce the risk of coronary heart disease. 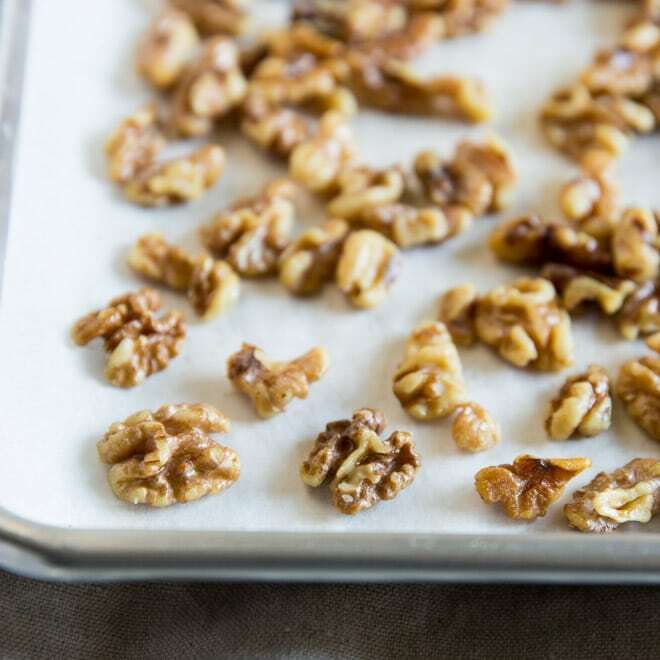 One ounce of walnuts provides 18g of total fat, 2.5g of monounsaturated fat, 13g of polyunsaturated fat, including 2.5g of alpha-linolenic acid, the plant-based omega-3. Preheat oven to 400 degrees. Line a rimmed baking sheet or parchment paper for easy cleanup. In a shallow bowl, whisk together egg, Dijon mustard, and 1/4 teaspoon salt, and 1/4 teaspoon pepper. 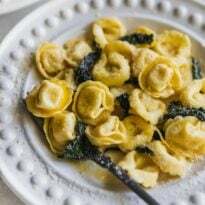 In a second shallow bowl, combine the ground walnuts, Parmesan cheese, garlic powder, and onion powder, 1/4 teaspoon salt, and 1/4 teaspoon pepper. Working with one tender at a time, dip the chicken into the dish with the egg, shaking off any excess. Then dip into the ground walnut mixture, pressing gently so the walnut coating adheres well. Place on the prepared baking sheet. Repeat with remaining tenders. Bake until golden brown and the temperature reaches 165 degrees on an internal thermometer, about 20 5o 25 minutes. Cool 5 minutes before serving on salads. 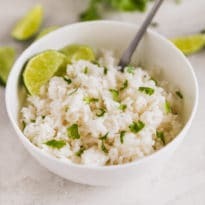 In a small bowl, whisk together yogurt, olive oil, lemon juice, honey, rosemary, and Dijon mustard. Season to taste with salt and pepper. Store covered in the refrigerator until assembling the salad. 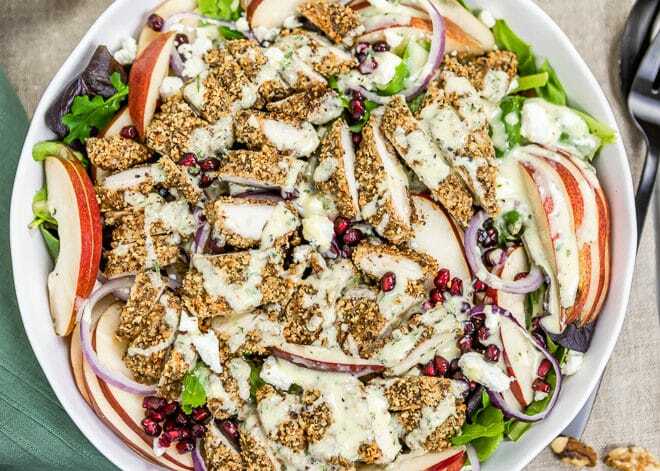 In a large bowl or serving platter, combine greens, sliced pears, pomegranate arils, feta cheese, and red onion. Or, compose salads in four individual servings plates. Top with cooled chicken tenders. Drizzle with dressing and serve immediately. I made this last night for dinner and it was delicious! It made me feel a little bit like we’re getting close to summer despite the freezing temperatures here in New York!